Certain green parrot species are more commonly kept as pets than others. If you've recently spotted a green parrot that you liked, you can learn how to identify the bird by its color, gender, feather pattern, and more. 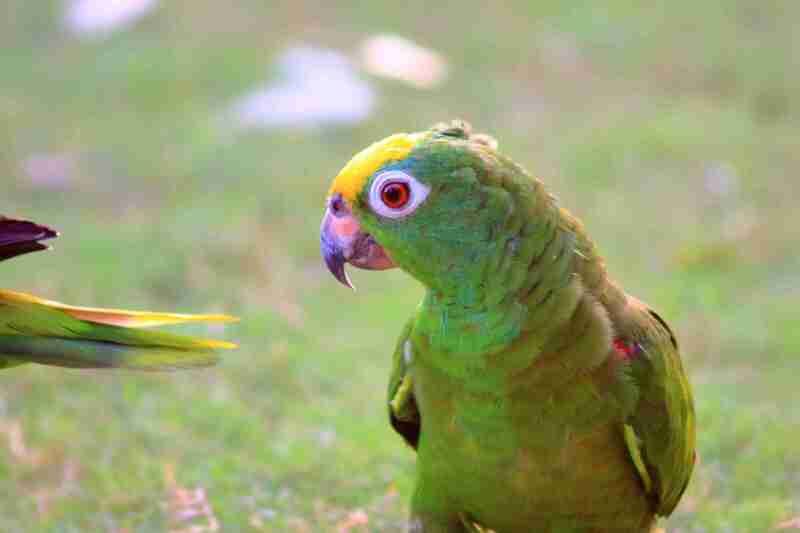 Learn about popular green parrots in the world and see which kind is best for you to adopt. While juvenile parrots may grow up to display a rainbow of colors, the majority of the plumage of most young parrots is a dull, dark, and green color. Most birds keep this color until they're around one year old, most likely to camouflage themselves from predators while they are young and helpless babies. An example of this can be seen in an image of young sun conures. As adults, these birds will have feathers in a variety of colors, including yellow, red, orange, green, and blue. One of the most striking green parrots is the eye-catching male Eclectus. The Eclectus is what's known as a sexually dimorphic species, meaning that you can tell the gender of the bird depending on the colors of its plumage. If you've spotted a large, bright, and green parrot with a prominent orange beak, chances are that you've seen a male Eclectus in all his glory. To adopt one of these gorgeous guys, check with a reputable breeder for advice on acquiring one. You'll also want to see if getting an Eclectus parrot would be a good fit for your lifestyle. One of the most common green birds kept as pets are the parakeet or budgie. While they aren't solid green, normal colored budgies are a mixture of pale yellowish-green interspersed with the typical black spotting and striping patterns that are characteristic of the species. These small birds are a great choice for people of all ages who are interested in becoming a bird owner. They are easy to care for, readily available, and can be housed in a relatively small space. While selective breeding programs have given rise to an array of colors within the species, regular colored Indian ringneck parakeets are mostly a bright pastel green color. Considered a dimorphic species, adult males exhibit a black and rose colored ring around their necks, while females lack the rings. This is not the best choice for beginner bird owners, as ringnecks are known to go through a "bluffing" phase during adolescence, characterized by hormonal aggression and territoriality. However, if you are a more experienced bird owner, an Indian ringneck can be a wonderful choice as a pet. Different varieties of lovebirds display different colors, but nearly all of them that aren't a type of color mutation are primarily green. Lovebirds are popular small pets with big personalities. Their name suggests that they are very affectionate, and many tame and hand-fed lovebirds can be. However, owners who don't have ample time to spend socializing with their birds might be wise to skip adopting them. If these birds aren't handled regularly, they can begin to lose their tameness, which results in painful bites. Only adopt a lovebird if you are able to spend plenty of time practicing bonding techniques with your feathered friend.